Even great love affairs end. Yes, I drew a whole comic strip about you last year and waxed rhapsodic about your graceful construction, hand-crafted from dried Tiger Grass stalks. 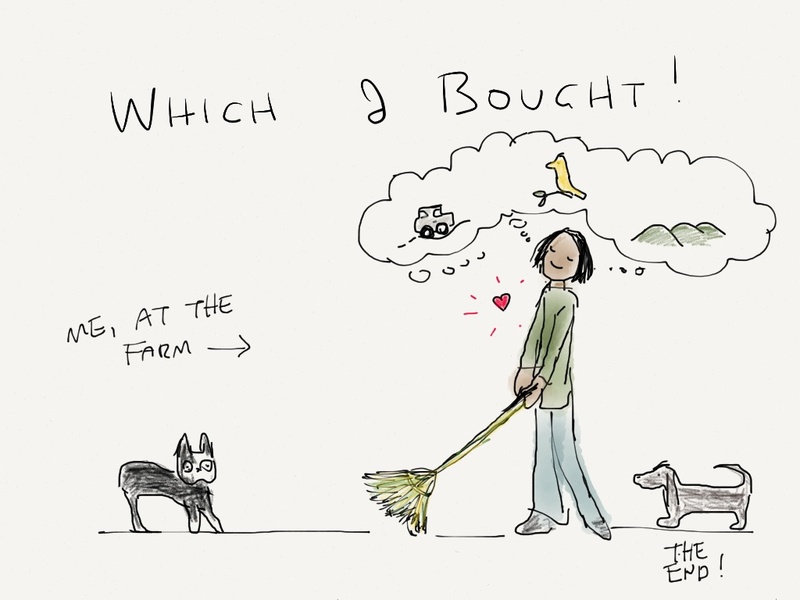 And I was so happy when I bought you from the roadside stall in the mountains and brought you to the farm. You brought me so much joy! Remember, the good old days? I didn’t think it would happen, but it did. You will now spend the rest of your days resting on the shelf with all the other cleaning implements I’ve tried and discarded while I … ROOMBA! The Roomba sweeps like a dream! By ITSELF! So when I say “I Roomba” all I’m doing is pressing the button and then emptying out the dirt bin! I didn’t really mean to replace you just like that. But the Roomba was a gift! How could I turn it down? And ok, while I was at it I also bought this plastic broom and dustpan set. 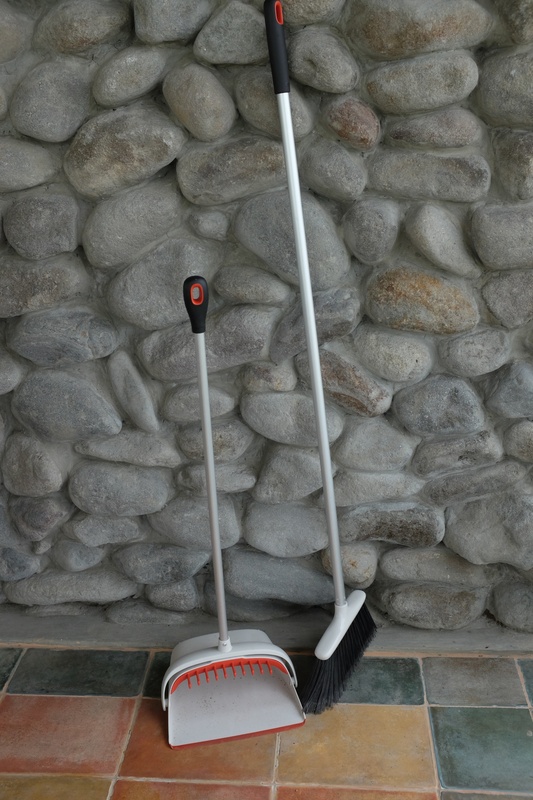 The stiff bristles are just better at getting into all those stony crevices where things tend to pile up. Thanks for the memories Walis. Maybe one day we’ll have a sweep for old times sake. LOL—so fickle! 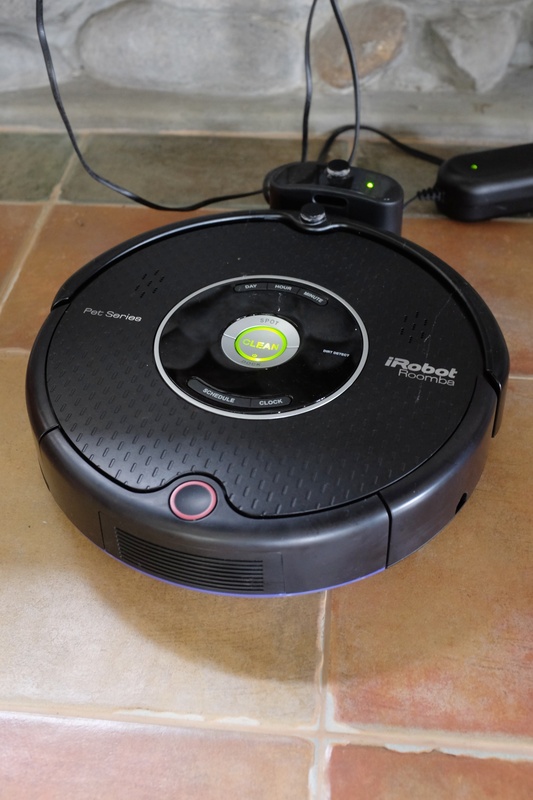 Maybe I should try roomba too….hmmmm. Review please after a while—how long do you let it run? I will write a review. So far, I’m very impressed. I think it does a better job than I do, and I’m no slouch at sweeping!! I just let it sweep until it’s done. When it’s done, it goes back to the dock and charges itself. Time depends on size of the room. You can even schedule it to clean everyday, but you’re supposed to empty the dirt bin after each session. I like how you write your posts! The title to the comic to the story are fun to read. I heard stories to be careful with Roombas if there are animals around. They have a tendency to spread poop.. or so they say. Thanks. I’m also enjoying your blog! Was also going to comment there that I like the way you make serious issues accessible and easy to read and understand. So far, I’m STILL very happy with the Roomba. Haven’t noticed it spreading poop (like lizard poop?) around. So satisfying to look at the contents of the dirt bin after it’s done a cleaning cycle! Thank you for the compliment 🙂 that was (and is) my goal since I think there’s a big gap between the findings of environmental groups and the public, especially in the Philippines. Next Next post: We’re Doing Ok!